If hedges are not maintained regularly they can fast grow out of control; we can work on the smallest dwarf conifer to the largest fully established hedge. 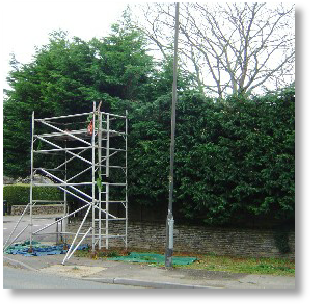 Our specialist equipment includes access platforms, high reach hedge trimmers/chainsaws and scaffolding towers (pictured right). We are happy to undertake regular hedge trimming on a yearly or half yearly basis, as well as one off jobs to get hedging back under control. As well as our regular hedge services, we can also remove hedging, including the stumps, and erect fencing in its place. This is a great option for people with very busy jobs and people who are not able to maintain hedges on a regular basis. Please see our fencing section for more details of the range of fencing we can supply and erect.